Built 1978 by Barton Myers. 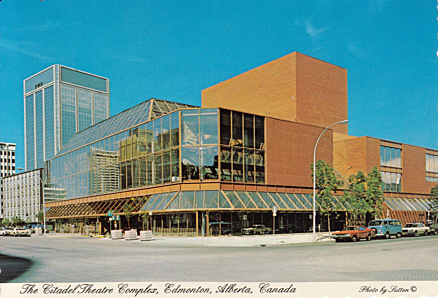 Front Text: "The Citadel Theatre Complex, Edmonton, Alberta, Canada"
Reverse Text: "The Citadel Theatre Complex. 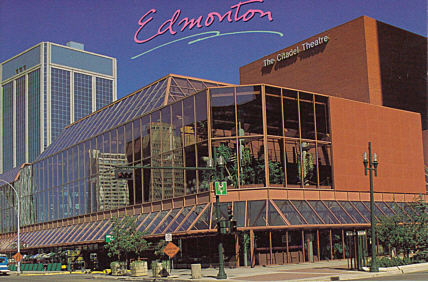 The Citadel Theatre Complex, completed in 1978, provides a glorious showcase for Edmonton's best professional theatre." Reverse Text: "The Citadel Theatre. This impressive glass and steel complex incorporates three theatres, a restaurant and an art gallery."